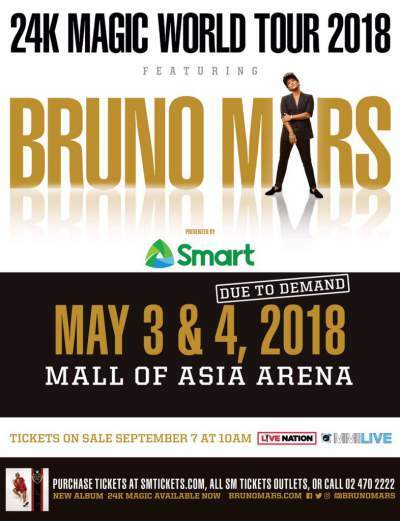 Bruno Mars adds second Manila concert date, tickets to go on sale September 8 - Balita Boss! 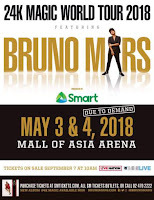 Bruno Mars’ concert at the MOA Arena as confirmed by concert promoter MMI Live will now be held for two nights, May 3 and 4, 2018 after almost 12,000 tickets of first day concert was sold out in less than an hour on Thursday, September 7. Tickets for the 2nd day will start sale on Friday, September 8 at 10 a.m. at the SM Tickets website or at any SM Tickets branch. Mars’ 24K Magic tour, which kicked off last March in Europe is in support of Mars’ latest album with three hit singles so far: "Versace on the Floor," "That’s What I Like," and the title track.